The makers of Formula 1's new behind-the-scenes documentary have accused Mercedes and Ferrari of letting down F1 by not taking part in the programme. Eight of F1's 10 teams agreed to provide Netflix with fly-on-the-wall access last season, and the 10-part series will be released on 8 March. But Lewis Hamilton against Sebastian Vettel does not feature prominently. "They did a slight disservice to the fans and the sport by not taking part," executive producer Paul Martin said. 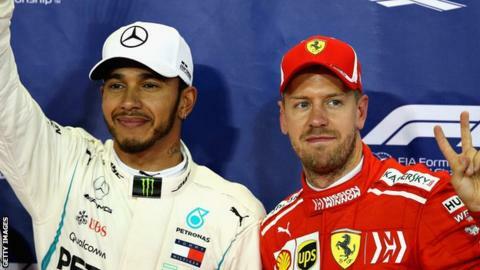 "It was going to be all or nothing and if those terms were good enough for the eight other teams, it should have been good enough for Mercedes and Ferrari, too," he told the Press Association. A Mercedes spokesperson said: "We were delighted to see that last season's compelling, year-long battle for the championship between Ferrari and Mercedes helped drive 10% growth in unique viewership for F1 worldwide and made the sport the fastest growing in the world on social media. "Competing for the world championship is an all-consuming business that demands every ounce of focus from the entire team; we are driven first and foremost by performance in every decision we make." Is this the cheekiest penalty ever? Read more on Is this the cheekiest penalty ever? How did Liverpool fans cope with cheering on Man Utd? Analysis and opinion from the BBC's chief Formula 1 writer. Get the latest results and headlines sent straight to your phone, find all our Formula 1 coverage details with our Live Guide, sign-up to our newsletter and learn where to find us on online.